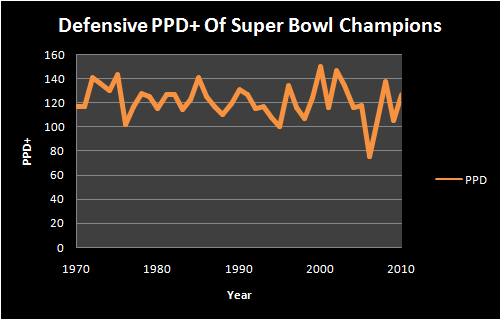 This graph shows the offensive and defensive components of passer rating differential for the Super Bowl winners.. As you’ll notice, every team except for the 2007 New York Giants had a positive PRD. The 2007 Giants had a QBR of 73.0 (10% worse than league average) and allowed opponents to put up a QBR of 83.4 (3% worse than average). B0th figures are amongst the most unimpressive of the Super Bowl era and emphasize just how unexpected their Super Bowl run was. This shows the QBR+ (passer rating relative to league average) of Super Bowl winning teams, broken down by the offensive (blue) and defensive (red) components. 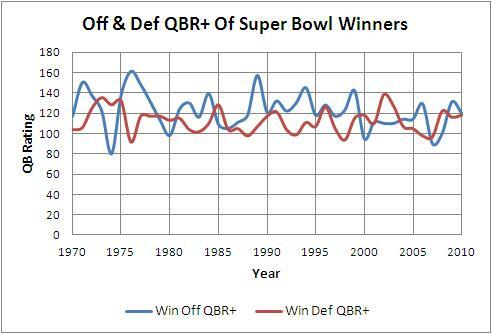 In general, Super Bowl winning teams have been better, relative to average, offensively than defensively in terms of QBR. However, there are a few more exceptions here than just the 2007 Giants. 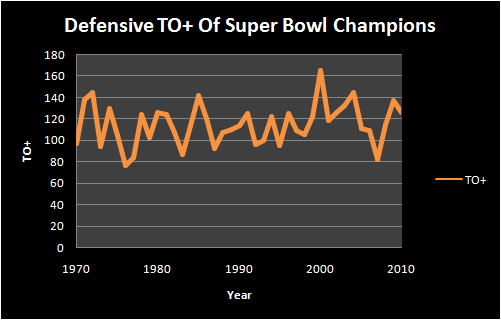 10 of the 41 Super Bowl winning teams since 1970 had more success on defense than offense. 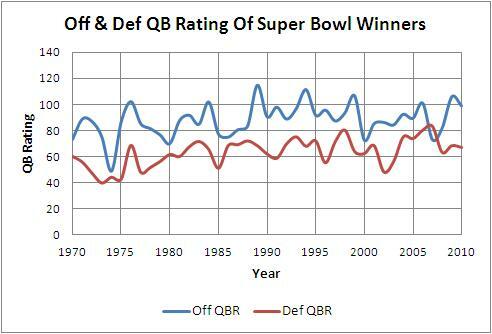 Super Bowl winners have averaged an offensive QBR+ of 122 and defensive QBR+ of 112. 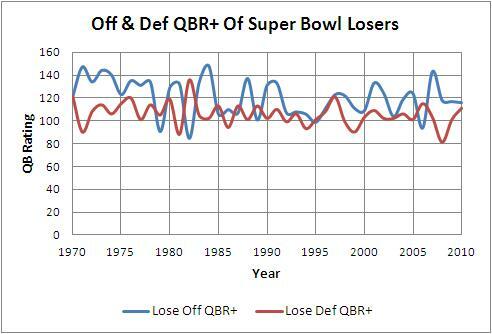 One interesting thing here is that the PRD tend to be a bit smaller for Super Bowl losers than winners. Since 1970, winning teams have had averaged a PRD of 24.5, whereas losing teams have averaged 18.6. As you can see in the chart above, the PRD of losing teams has been decreasing since the late 1970’s. 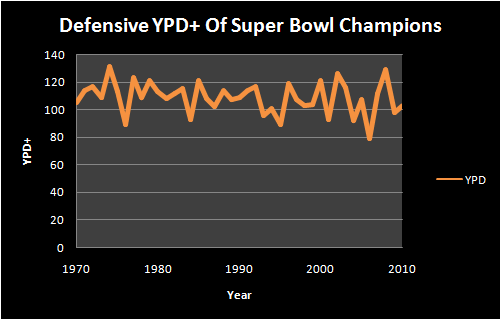 As with Super Bowl winners, Super Bowl losers tend to be better (relative to league average) on the offensive side of the ball than on defense. 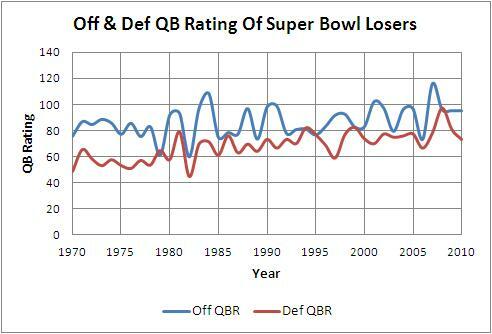 Super Bowl losers average an offensive QBR+ of 120 and a defensive QBR+ of 105. 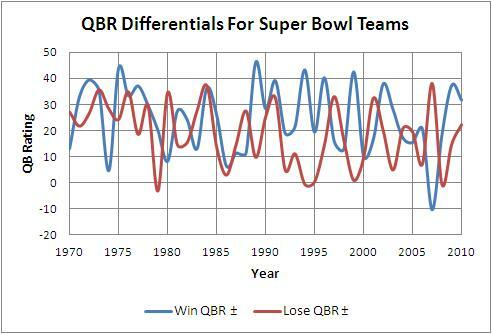 Since 2000, there have been 6 Super Bowls where one participant has had a better defensive QBR+ than offensive QBR+. 5 of those 6 teams has gone on to victory, with the exception being the 2006 Bears. That’s a reversal from the previous trend where the more defensively inclined team had lost 6 of 8 matchups from 1970-1999. On paper, it’s a very close match up of two teams with similar regular season stats. Both teams were a little below average in stopping the pass, but decidedly above average in passing offense. Like the 2007 Giants, both teams (especially the Giants) have played better defensively down the stretch than their final 2011 numbers indicate – although I’d expect both teams to struggle to contain their opponent’s passing attack on Sunday. Ultimately, like most football stats, Passer Rating Differential isn’t particularly useful in predicting a winner in a 1 game sample with two pretty evenly matched teams. While they help us fill the two weeks prior to the Super Bowl, stats are no match for, and can’t really forecast, a great coaching effort and execution of a superior game plan (not to mention a little luck). The first thing that stands out is that elite (top 5) scoring offenses have won a Super Bowl just 3 times since 2000. So 8 of the 11 Super Bowl winners had a non top 5 offense. In the 20 years previous, only 6 teams had a non top-5 offense. Between 1970-1999 only two Super Bowl champions had a non top-10 offense. That’s happened 5 times in the last 11 years. Furthermore, 2 of the last 4 Super Bowl winning teams (2007 Giants, 2008 Steelers) had very mediocre offenses. 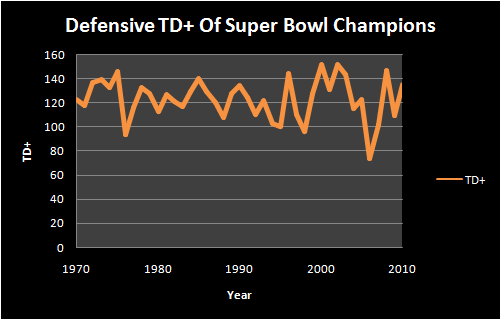 Also weakening the “offense wins championships” is the fact the 2007 Giants’ “bad defense” was (almost single-handedly) responsible for a Super Bowl win and played much better down the stretch than their overall season ranking indicates. Looking ahead to Super Bowl 46, we see two teams with better offenses than defenses. The Patriots were 3rd in offense, 15th in defense. The Giants were 9th in offense and 25th in defense. However, like in 2007, the Giants (and also the Patriots) are playing much better defense of late. Because both offenses are so good, Super Bowl 46 could possibly be a repeat of Super Bowl 42 where a statistically unimpressive defense is responsible for winning the game. One has to look no further than the 2011 Saints and Packers to see that the NFL is still very much a league where an effective defense trumps an elite offense.